Dig into our New Flavor Variety Pack to try our 3 newest MacroBars. The MacroBar New Flavor Variety Pack contains 4 bars of each of the 3 new flavors including Blueberry + Cashew Butter, Mocha Chocolate Chip and Dark Chocolate + Almonds. Loved the taste and texture! ill be purchasing again. Gomacro are my favorite bars but the customer service is even better. These two chocolate bars are delicious and the blueberry exceeded my expectations. Highly recommend all around. My husband and I love this Sampler Pack! We're obsessed with GoMacro, but these are probably our top picks. Love that they can be ordered together in a pack! I love the new flavors! Love all the new flavors! My favorite is the blueberry- It packs a strong blueberry flavor! I enjoy knowing that when I grab a snack for me or my children that it's healthy, clean, organic, and gluten free! It takes a little worry out of my constant search for good food! The new flavors are great. Blueberry is yummy and the chocolate almond is good. About to try the mocha chip! Everything you’d expect from a GoMacro Bar. I wish the texture wasn’t quite as sticky but I appreciate the high quality ingredients and flavor combos! Whatever they come up with, it's always delicious. The new flavors are great, too. GoMacro is really the best on the market. I think that these new flavors are 3 of the better flavors that Macrobar has! Sweet awakening has a subtle hint of coffee bitterness that pairs well with the dark chocolate. Protein Decadence is as purely chocolate of a flavor that they have. Blissful Daybreak is more like their other bars with more of a "plain" base for lack of a better term, with chunks of flavor in between. After trying all of their flavors, these 3, along with Protein Replenishment, are my definite go-to's. GoMacro bars are perfect for athletes! As a competitive vegan runner, I travel with them all the time and these new flavors do not disappoint! I’m so glad you’re making your products. I’ve been trying quite a few flavors and really enjoy the blueberry cashew butter bar and the mocha chip. But every flavor i’ve tried has been fine, although some taste just a bit too sweet and so I feel a bit of the flavor has been lost. With 10 grams of protein, they’re great for breakfast or lunch on the go. Organic. Vegan. Feel good about putting them in my body. My husband and I like these bars better than any other we've tried. And we've tried MANY! Love all the flavors. I needed something low sodium so GoMacro bars are perfect. Can’t say enough good about these. I love this whole pack so much. The flavors are so delicious. So good. Highly recommend. My favorite flavors of all the flavors. Without a doubt will be purchasing again. Gomacro bars are my favorite bars on the market! These new bars are awesome! I particularly like the dark chocolate with almonds, but they are all very good. Absolutely my favorite flavors so far. I usually order the ‘assorted’ flavors but this new sampler pack is outstanding. I love them all, although I do think the Mocha Chocolate Chip is the best one. I hope these stay on the menu for a long time! These new flavors are the best. They are much softer when ordering direct from GoMacro. The only thing I wish was different was that there were no added flavors in the blueberry one. I wish they just added more blueberries instead or left it out. Other than that, perfect. Note for parents: these are perfect for picky toddlers on the go. Sooo good! Love these new flavors! SO GOOD! Absolutely love all three of the new flavors. I'm so happy they're all high protein as well. They're clean ingredients and so delicious! The new flavors are awesome! I especially love the dark chocolate almond!! I run and bike so I use these to fuel up because they are filling and high in protein. The case I received were all super soft and chewy. I throw one in my bag in the morning and it gets me through until lunch. YMMV: I didn’t like my sampler case, sadly. The mocha, be warned, has caffeine in it. The chocolate is merely chocolate - no texture or taste variations. And the blueberry is very fruity, not subtle. That said: if you crave a very fruity bar, get the blueberry! If you crave chocolate but don’t want to eat a candy bar, this one is perfect for you. And if you want a little pick-me-up, the mocha is meant for you! I love Macro as a company and in other flavors, but these just didn’t work me. MACROBAR NEW FLAVOR SAMPLER PACK This sampler pack is AMAZING! I am super ecstatic that GoMacro decided to do something with a coffee flavor and the Mocha Chocolate Chip is outstandingly delicious! Also a huge fan of the other two, Dark Chocolate & Almonds, plus the Blueberry. These are my favorite and have already been through about three boxes. Can not wait to see what else GoMacro has in store for its customers. The sampler pack contains a bar that is now my new favorite. The dark chocolate almond butter is fantastic. 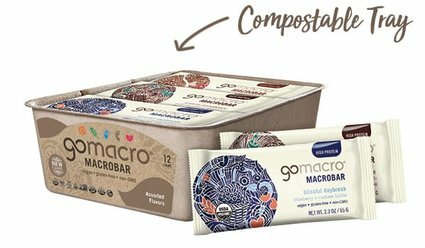 I didn't realize how soft and chewy these bars could be until ordering directly from GoMacro. I workout early in the morning on most days of the week. Half of one of these bars gets me out of bed...I seriously look forward to it. The chocolate mocha is also very good and is the perfect blend for me. The blueberry bar tastes like I'm licking a bowl of batter from a batch of blueberry muffins. I'm very, very happy with these bars. LOVE these new flavors! Each one is more delicious than the last! They are all HIGH protein and serve as a wonderful energy source on the go. Great job! !